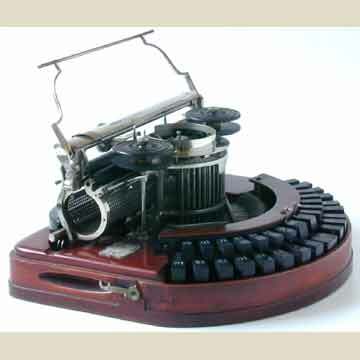 The Hammond 1 Typewriter appeared in several different shapes, after it was introduced in 1884. For full details on the Hammond 1, check the hammond 1 page. The two pictures on the left show the Hammond 1 as the 'exhange' model (serial number 154 EXCHANGE). The only difference with the original Hammond 1 is that the mahogany cover of the mechanism has been replaced with a semi-circular strip of wood. The two pictures in the center show a later version of the Hammond 1. This is the version with the round keyboard, but with the open mechanism (no wooden casing) that is generally known as the Hammond 1B. The pictures on the right show the Hammond 1 with the straight keyboard, that first appeared in 1889/1890. This Hammond 1 seems most similar to later models, because it has round keytops with metal rings around them. The only obvious difference between this machine and later straight Hammonds, is the two piece type element.